When you need the top of the line, brightest lights for your 4k footage, professional video shoot or just to wow your friends on social media, a professional level video light is right for you. These lights take power levels off the charts with lumen ratings starting above 6,000 lumens per light. They feature the highest quality LED's, construction and performance. Typically these offer only a wide white beam, designed for lighting video beautifully. 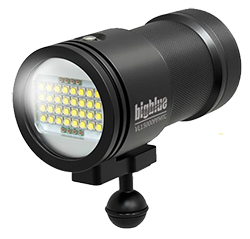 If you are looking for an all around, multiple function light, check out our Video Light Guide. The Light & Motion Sola Video Pro 9600 is a great light option for the demanding underwater photographers and videographers. It provides 9600 lumens of light. It also features a cooling system designed to provide the best performance. The 90° beam creates even lighting without hotspots. Another great feature of the video light is it's factory sealed, so there are no o-rings to maintain. The Kraken Sports Solar Flare Mini 8,000 Video Light provides a high output video light in a small body. 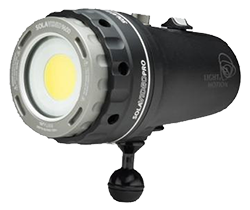 The video light features an output up to 8,000 lumens with a wide, useable 120° with the domed front. The burn time is also impressive as it could reach 66 mins at full power! It is also compatible with the Kraken Remote Control for easy operation. 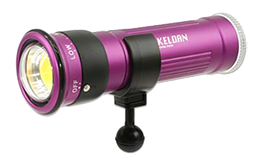 The Keldan Video 8X Flux Video Light boasts a powerful 13,000 lumens with a high color rendering rating. The domed port and high quality LED's return a soft, even light with no hotspots at all. Gradual fall off leaves a fully usable 110° beam angle. The light is controlled by a simple slider switch with three power levels. The depth rating of the video light is also impressive, rated at 200m. 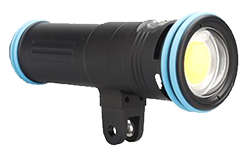 The Big Blue VL15000P Tri Color Video Light is a super high powered video light which offers up to 15,000 lumens. This power is packed into a fairly compact body with an array of high powered LEDs. One great feature of the video light is it's tri color lights. It has a cool white, warm white and red beam. The warm white is great as it reproduces skin tones really well and helps make the reds / oranges really pop underwater. Battery life is also longer than many lights at up to 2 hours on full power.